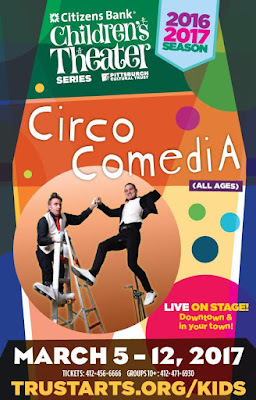 We love going to unique shows as a family and Circo Comedia looks like a great one! I'm pretty sure it's going to pull lots of laughs out of my kids and they're going to love seeing these fun stunts. 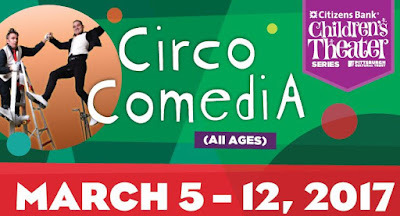 The Pittsburgh Cultural Trust is proud to present Circo Comedia as part of Citizens Bank Children’s Theater Series. Performances take place March 5 through 12, 2017 at six performance locations throughout the area. Unpredictable thrills, side-splitting comedy and daredevil stunts are the signature style of Circo Comedia starring the fantastic duo Jean Saucier & Patrick Cote from Montreal as they perform their distinctive style of humor, acrobatic tricks, daring feats, magic and eccentricity. Following in the tradition of the Quebec Circus, Jean Saucier, master equilibrist, juggler, trick cyclist, acrobat and magician performs his feats from dizzying heights while Patrick Cote, clown, expert roller skater and drummer, innocently tries his best to be the (imperfect) assistant. Delirously funny. Filled with unforgettable moments. Jean Saucier has been performing since a young age. At 18, he attended the École National du Cirque de Montréal. He was later hired by Cirque du Soleil. 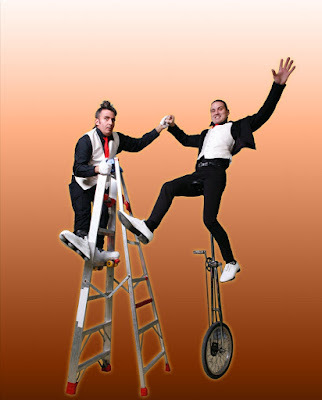 From 1999-2006, Saucier performed with his first Circo Comedia partner, Lawrence Smythe. 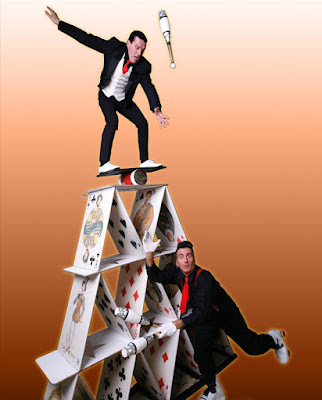 In 2004, Saucier began performing Circo Comedia with current partner Patrick Côté. Patrick Côté also trained at École National due Cirque du Montréal. Since the late 1980s, Côté has been creating comedic characters and performances for an array of audiences. He joined Saucier in Circo Comedia in 2004. 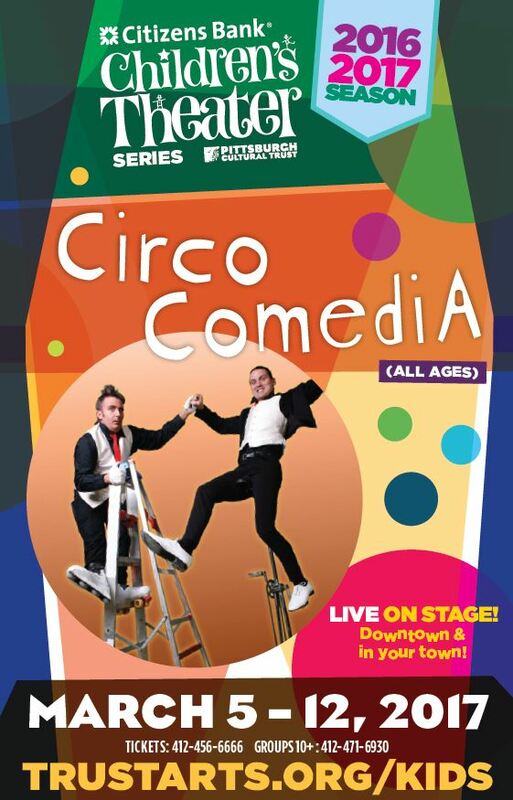 For more information, visit www.circocomedia.com. The best part is that tickets start at just $10! 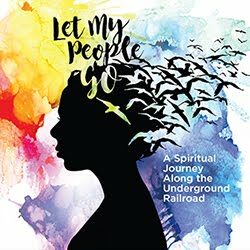 Individual tickets (General admission: $12 at the door; $10 in advance) can be ordered online at www.TrustArts.org/kids, by calling 412-456-6666, or in person at the Box Office at Theater Square, 655 Penn Avenue. Group tickets can be ordered by calling 412-471-6930. Children under 2 are free but require a lap pass. Subscriptions and Flex Ticket Packages to the Pittsburgh International Children’s Theater series are available by calling 412-456-1390. 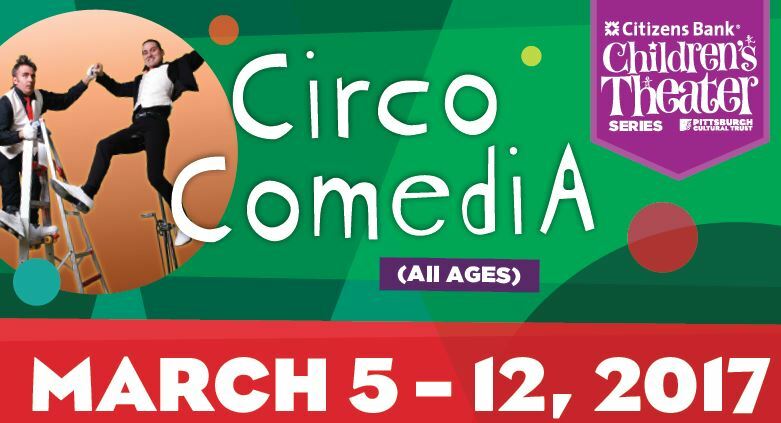 City: Byham Theater, March 5 at 2:00 p.m.
East: Penn Hills High School, March 8 at 7:00 p.m.
North: Marshall Middle School, March 9 at 5:30 & 7:30 p.m.
West: Avonworth High School, March 10 at 7:00 p.m.
South: Mellon Middle School, March 11 at 11:00 a.m. & 2:00 p.m.
Butler: Seneca Valley Senior High School, March 12 at 2:00 p.m.
All ages are allowed. Children under two are free but require a lap pass to enter. This post sponsored by Pittsburgh Cultural Trust, so I received compensation or products in exchange for my promotion. All opinions remain my own as I don't endorse companies that I don't value. My daughter is always amazed by the high quality of life performances that we see. She leaves motivated and excited about perfecting her craft. I'm certain that this show would have the same impact on her. My daughter is always inspired after seeing a live show. She will sing, dance,and copy what she saw. So exciting. Sounds very nice. This show sounds very exciting and would make an impression on my kids. This looks amazing, I would love to take my son and a couple of his friends! Disney on Ice: Discount code!